The Parlor was a center of social activity at Monticello. Here Jefferson and his family and guests engaged in conversation, read, played games, and performed and listened to music. 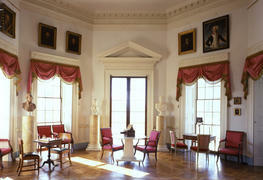 The room displayed much of Jefferson's art collection and was the site of family weddings, dances, and christenings. Dimensions 27' - 3" x 23' - 8"; height 18' - 2"
Color Unpainted plaster, with a Jefferson-designed parquet floor of cherry and beech.